The Microsoft Certified Solutions Expert (MCSE R2): Communication certification validates candidate’s expertise in creating and ensuring a consistent communication experience for the organization while connecting colleagues to people around the world. MCSE Communication generates core skills in candidate to efficiently manage Lync Server 2013 infrastructure. The communication in medium to high level organizations need complex but sophistically managed Unified Communications. The MCSE certification in Communication develops expertise in creating consistent communication experience for an organization. Microsoft is continually advancing in technology and progressively launching its new techniques to ensure greater reliability, consistency and ease of use. The Lync Server is part of the new version of Office, especially focusing on communications. It helps in providing anywhere access to office applications like documents, calendar, email, HD video conferencing, and enterprise social networking across multiple devices like desktop computers running Windows 8 and 7, Smartphones, tablets, notebooks, etc. 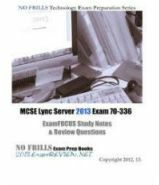 Microsoft Certified Solutions Expert (MCSE R2): Communication helps candidate to learn and adopt ability to plan, design, deploy, and manage Lync Server 2013 in an environment that includes Lync Online and legacy services. Translation of business requirements into technical architecture. Comprehensive design for a Unified Communication solution. Verification of skills around IM, presence conferencing, and Persistent Chat. What is included with the MCSE: Communication Course?